1. The outer leat which is the exterior part of the wall. 2. The cavity, the continuous air space. 3. The inner leaf which is the interior part of the wall. Cavity walls eliminate the penetration of moisture from outer leaf to the inner leaf and thus help keep inside of the building free from dampness. The air in the cavity wall acts as a non-conductor of thermal heat and hence minimizes the transmission of heat from the external face of the outer leaf to the internal face of the interior leaf. Thus cavity walls help greatly in the thermal insulation. The air in the cavity acts as a cushion for absorbing sound, by adopting cavity walls buildings may be rendered sound proof as considerable external noise gets absorbed in the cavity. As dampness is not allowed penetrate by cavity, the inner wall of the cavity which is always a load bearing wall is kept free efflorescence effects. Cavity walls are found to cost about 20% less than the construction of same thickness solid wall. As already stated, the cavity walls have two leaves- inner and outer with hollow space in between them. The width of the cavity varies from 50 mm to 75 mm. The thickness of the outer leaf wall which is usually non-load bearing is half brick. The two portions of the wall are connected by wall ties or bonded bricks. metal wall ties are spaced horizontal intervals of about 0.90 mm and vertical interval of 450 mm. the wall ties should be arranged in staggered form. The outer wall is always in stretcher bond, but it can be constructed in other bonds as well, by using brick bats. 1. Contact between two leaves should be avoided. 2. The cavity should be kept clear of droppings. This can be done by using a wooden batten during construction. Temporary openings may be left at the bottom of the cavity to afford access and removal of droppings. 3. the main horizontal D.P.C must be in two separate widths and the bottom of the cavity must be at least 150 mm below this. 4. Heads of openings must be protected by damp proofing material. Jambs must not be solid unless DPC is provided. 5. Deep holes should be formed immediately below the main horizontal DPC over openings, if necessary. 6. Cavities must be rust proof, capable of preventing rain transmission and easy in cleaning of mortar droppings. 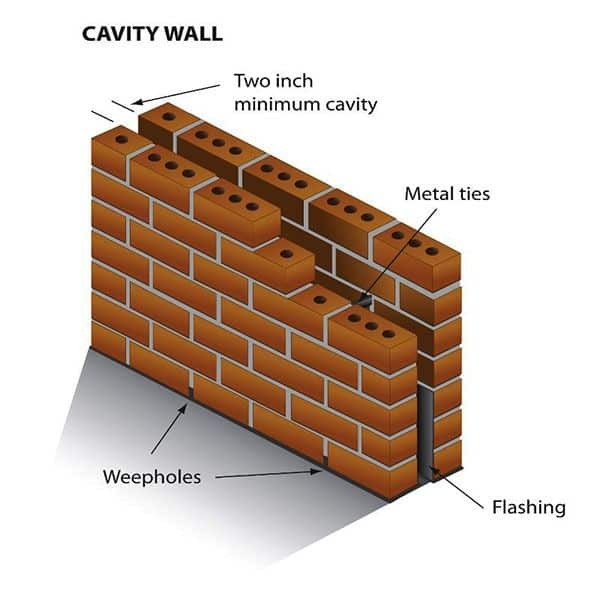 Although cavity wall is good for damp prevention, thermal insulation and also cost effective, but it is rarely used in modern building construction. I don’t know why. Could you please tell me why it isn’t used widely?